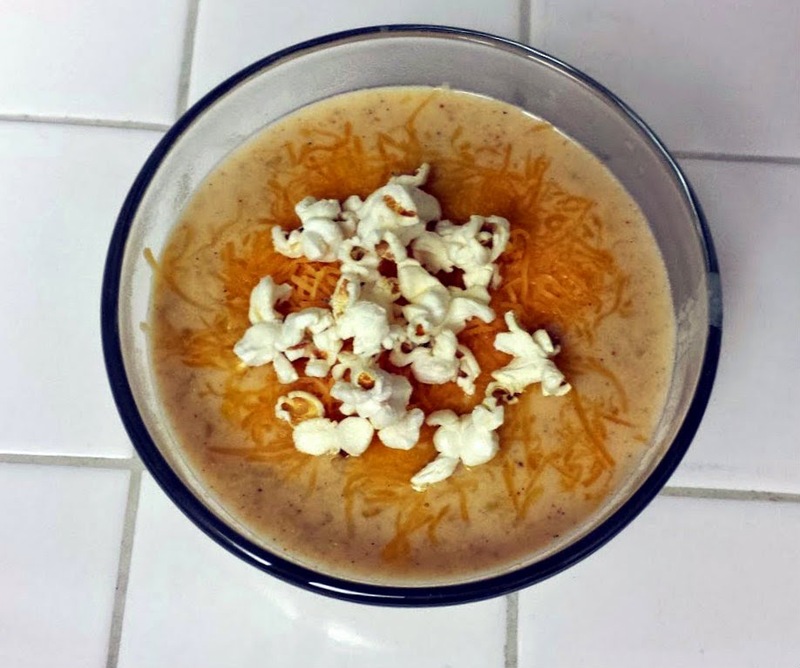 As you probably guessed, the original recipe isn't really called "Sarah's Popcorn Soup." 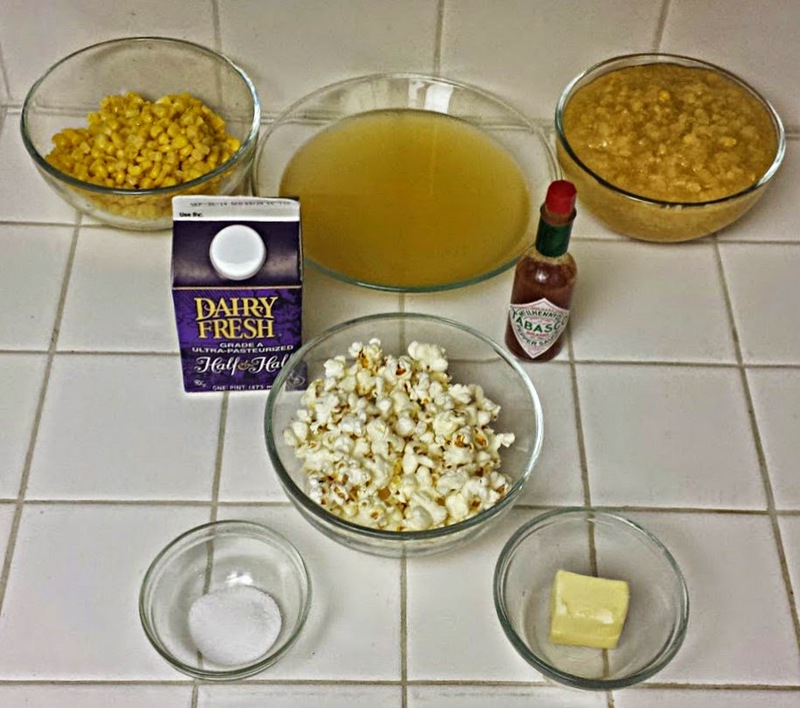 It's actually called "Nancy's Popcorn Soup." However, I'll tell you that the original iteration of this recipe...is not very good. It's kind of tasteless and bland (even with the added hot sauce), and I wanted so badly for this recipe to work that I took to my spice cabinet and made it awesome. It was incredible once some magic was worked on it. Truth be told, you don't even really need the popcorn -- it's kind of a kitschy topping, but it was fun, and I really liked it. Also, I'm not known for being terribly observant, and my memory/attention span is roughly that of a gnat, so I had a couple moments the night we had this soup that made me think I was actually losing my mind. I put the popcorn garnish on mine (Dennis didn't want the popcorn), and set it on the table while I did a couple of things. When I got back to the table, there was no popcorn on the soup. I was pretty sure I'd put some on there, but I also know how quickly I forget things, so I didn't think much of it and put more on. I went into the kitchen to do something else, and when I came back, the popcorn was gone again. At this point, I was fairly certain I was losing my mind, and I actually looked over at Dennis to see if he was snatching my popcorn when I walked away. He wasn't paying any attention. Pour corns (plain and cream-style), half and half, and broth into a large pot and heat over medium heat, stirring constantly for the first few minutes. Continue cooking, stirring occasionally, until the soup thickens and is hot (not boiling). Stir in the Tabasco, garlic powder, Cajun seasoning, nutmeg, and black pepper. Cook, stirring occasionally, until it has reached desired thickness. Remove from heat and stir in butter. Taste and add more seasonings as needed. 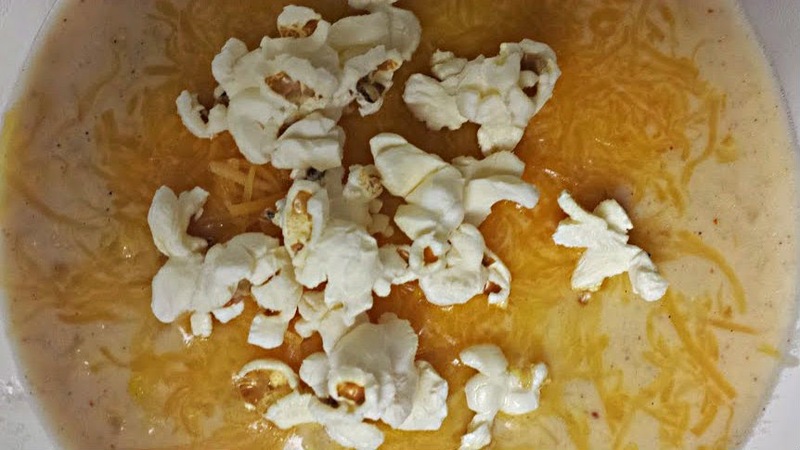 Garnish with cheese and popcorn. I know, I know. I just did a "recipes from boxes in your pantry" book last week. And I was irritated about it. I guess the difference between this one and that one is that this one brands itself as a cookbook that "doctors canned, frozen, boxed, bagged, and ready-made deli food" into meals. It's up-front and honest about what it is, and what it's doing, and it doesn't pretend that Velveeta is gourmet. In the book, this recipe only has two ingredients. Doesn't get much easier than that. However, I decided to make this one into a chicken salad instead of just the chicken, and it was so good. So good. You don't have to have this one as a salad, but I highly recommend it. I also didn't do all the pounding of the chicken that was called for, so I had thick chicken pieces that I honestly did not understand how they were so good. 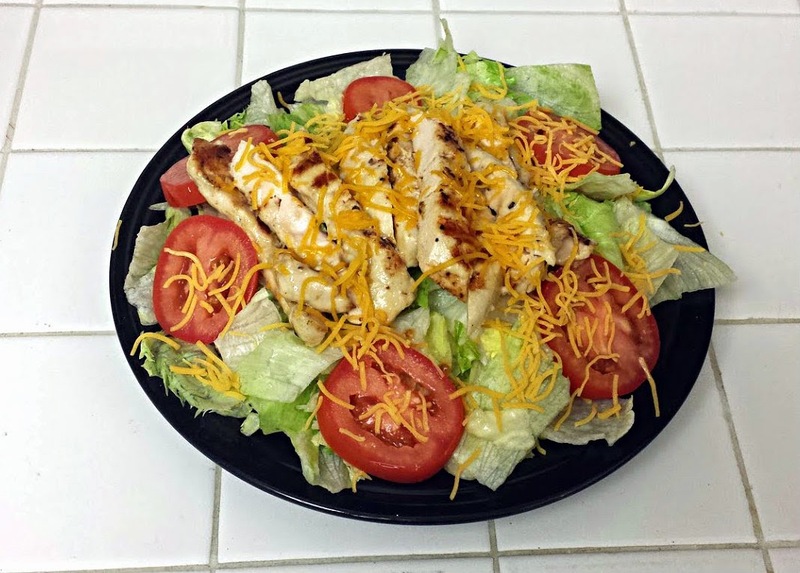 Place the chicken in a large bowl (glass or ceramic preferably) and pour the dressing on it. Make sure the chicken is well-covered. The recipe recommends using a real grill. I used a George Foreman grill. 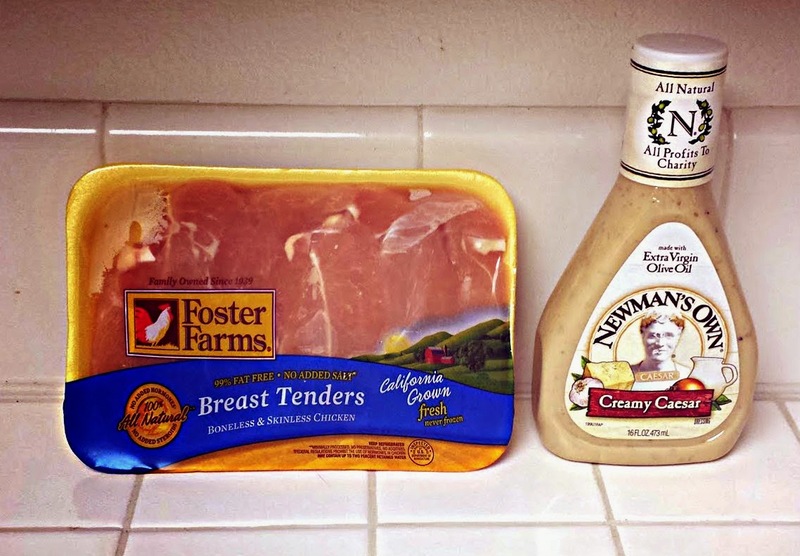 Shake excess marinade off and place chicken on grill/GFG. 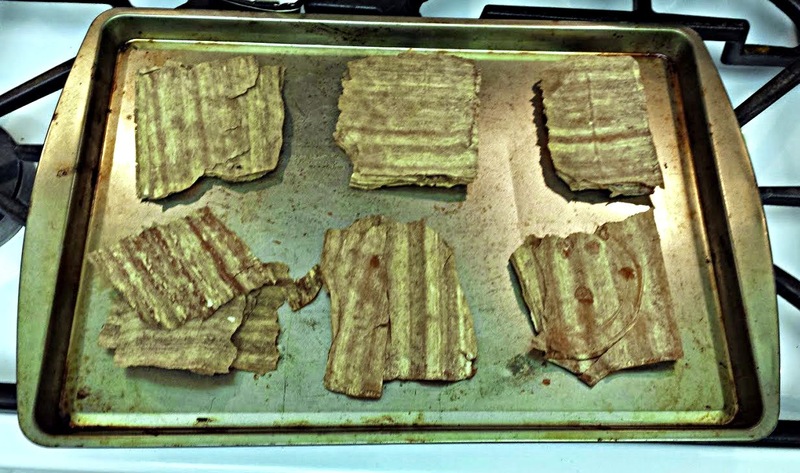 If you're using a grill, flip the pieces every couple of minutes to cook evenly. If you're using a GFG, close the lid until the chicken's internal temperature reaches at least 165°F. 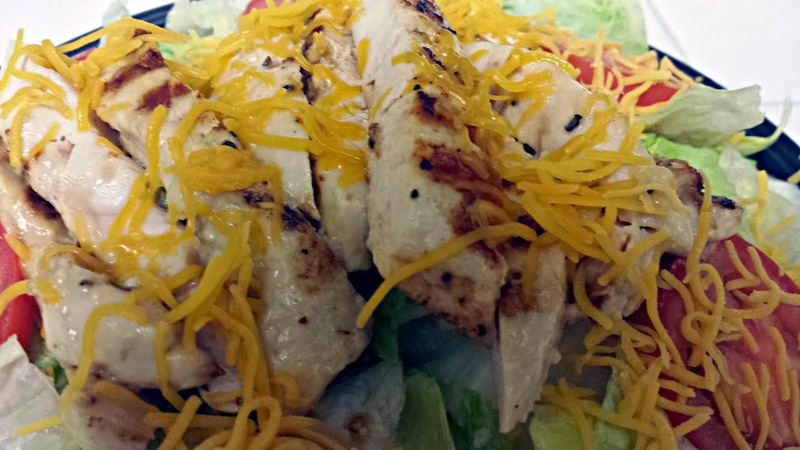 Slice chicken, prepare salad if that's what you're doing, and serve. End of Summer KitchenAid Giveaway! You guys know the drill! Also, make sure after entering to win, you download the free eBook the bloggers involved in this giveaway have put together! Get yours here! I'm angry at this recipe. I've already mentioned my feelings about the whole Semi-Homemade empire, so just allow me to expand here. I made this "stew," grumbling to myself the whole time. (NOTE: Yes, I realize I chose this recipe, but I needed something out of this book. I don't think I really read the recipe through and understood what was going on until I made it.) I served it. Dennis ate some and was like, "This is...amazing. This is so good." Of course it's good! It's canned soup! I told him, "Don't be too impressed with it," and he said, "Well, I know you were in there cooking for a while, and you cooked the meat. So yeah, it's really good." I just can't, Sandra Lee. I simply cannot. So here you go. 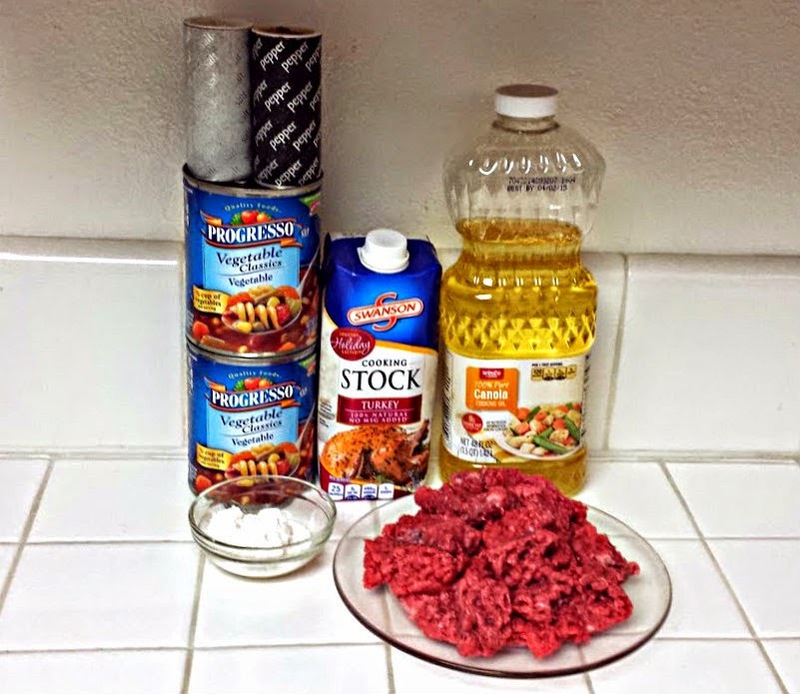 Here's a "recipe" for "stew" sans lovely, puffy rounds. I don't know why I don't have a picture of the finished product...rage-induced amnesia, perhaps. Sprinkle beef with salt and pepper, then toss beef with flour to coat. Heat the oil in a heavy pot over medium-high heat. Cook the beef until brown. Add the broth/stock and bring to a simmer. Add the soup and simmer, uncovered, for 15 minutes. Thanks for bearing with me while I took a couple weeks off. You ever have one of those times when life just all starts happening all at once? That happened to me. But I'm back, and here to give you some...semi-homemade recipes. 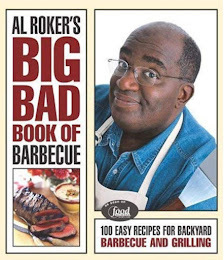 So, I struggled with this cookbook. I know why I have it (got it free when I worked at the library), but I don't know why I kept it. I have a real problem with the whole semi-homemade brand. I won't get into all of that, but suffice it to say I wasn't thrilled about my vow to myself to cook out of every cookbook I own. 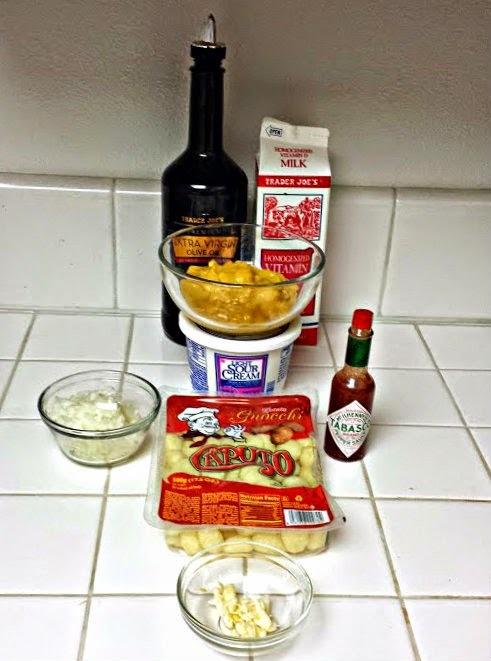 It's hard to mess up gnocchi, though (obviously, I love it), I decided to give this recipe a shot. And it was pretty good! 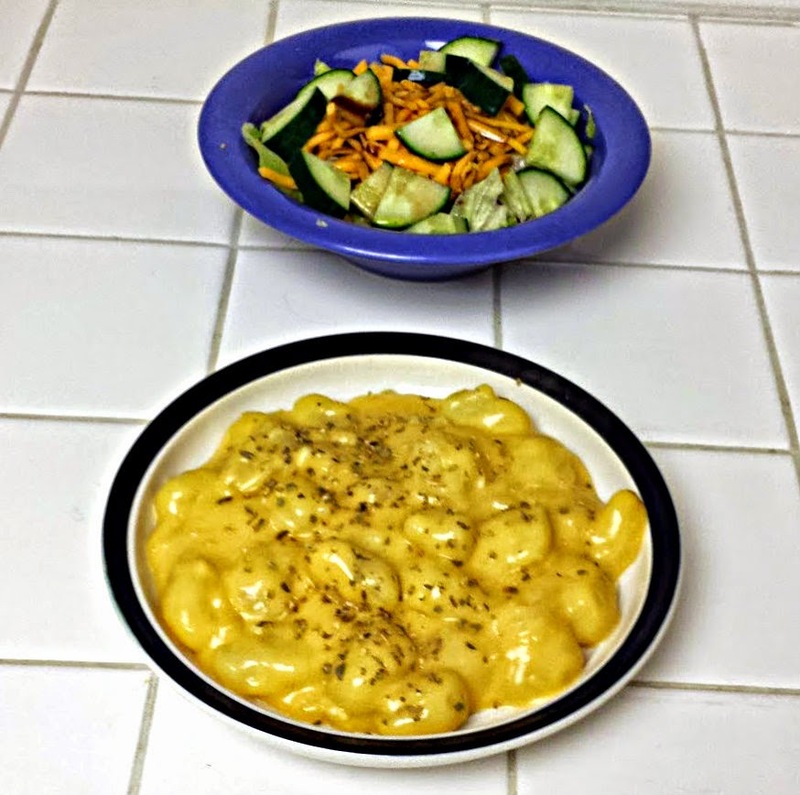 Two major changes I made was (1) I didn't use canned garlic -- I used fresh; and (2) I didn't use Velveeta like the recipe called for -- I used cheddar cheese soup. Still within the confines of "semi-homemade" (Read: out of a can), but less plastic. Oh, and I added oregano. And mixed the sour cream in instead of it being a topping. And like tripled the hot sauce. Heat olive oil in a large pan over medium heat and saute onion and garlic about 2 minutes, until the onion is tender. Add soup, milk, hot sauce, and sour cream. Stir until well-combined and hot. 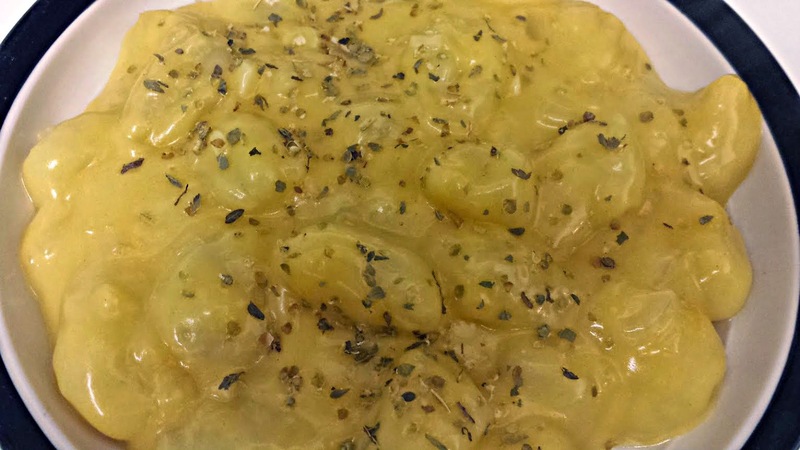 Fold cooked gnocchi into the sauce. This recipe is not as complicated as it looks at first glance, I promise, even though I was making them, and said to Dennis about halfway through, "I don't want to do this anymore!" All whining aside, these are really good, and not as hard as you'd think. 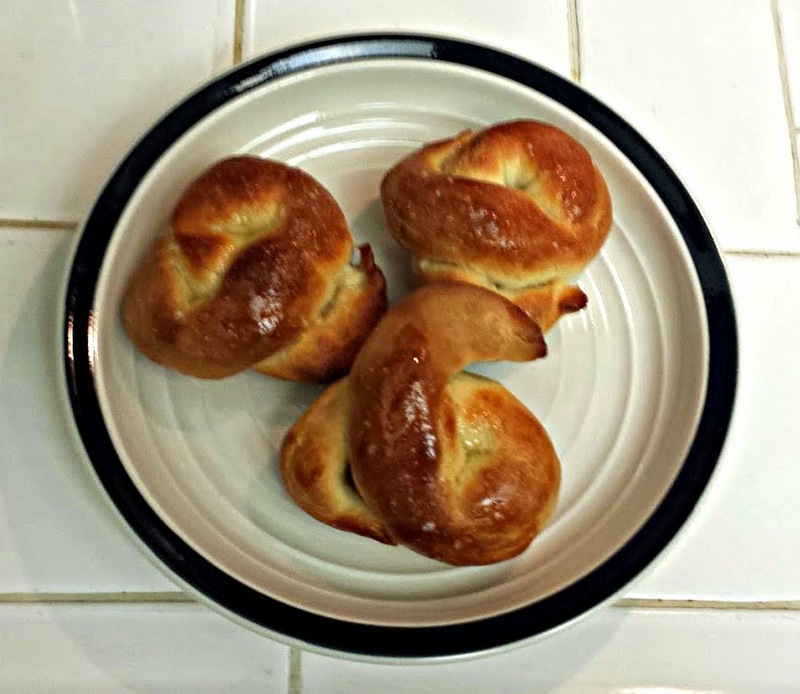 I did look up a YouTube video on how to twist pretzels so they look like...pretzels, but then decided learning how to twist pretzels wasn't on my agenda for that particular evening, so instead, mine look more like pretzel knots. That's OK, though, because they're delicious. 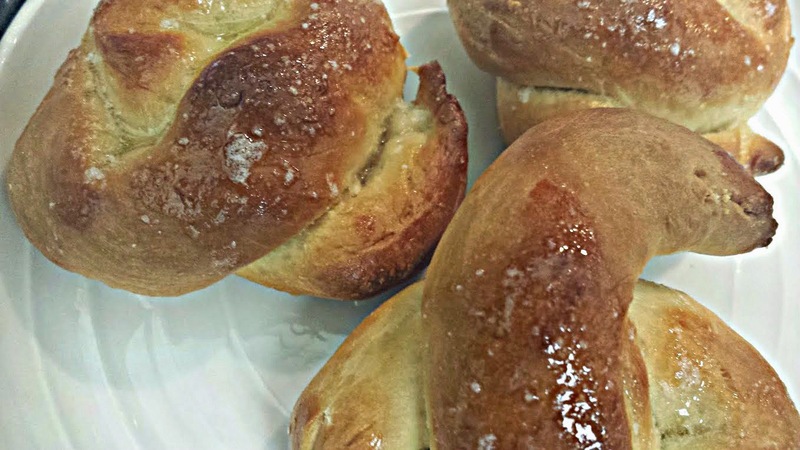 Seriously amazing pretzels. So take a few hours on a weekend and try these out. They're worth it. Put the butter into a small pot. Melt over low heat, then measure out 1/4 cup and set aside to cool. Separate the egg white from the yolk. Put the white in a small bowl and set in the fridge for use later. 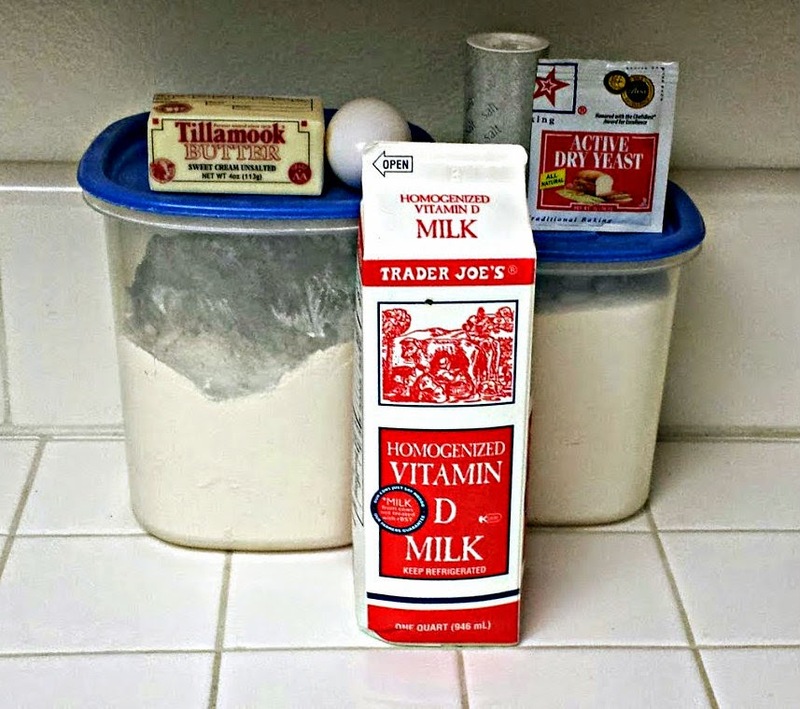 Put the yolk into a large bowl and mix with the sugar, salt, cooled 1/4 cup butter, milk, and yeast mixture. Stir until well-blended. Add the flour to this mixture, 1 cup at a time, stirring well after each cup. Knead the dough for about 5 minutes by hand, until it's not sticky (if it was to begin with). Put a clean towel over the top of the bowl and let the dough rise in a warm place for 1 hour. Preheat oven to 425°F and either spray a cookie sheet with olive oil or cover in aluminum foil. Brush the tops of the pretzels with the egg white you stashed in the fridge. Sprinkle each pretzel evenly with salt. Bake the pretzels for 15 minutes, or until they're light brown. After removing the pretzels from the oven, brush the tops with the leftover butter in the pan.